Obviously, the remarkable high-resolution screen makes iPad absolutely perfect for watching movies anywhere and anytime. Moreover, the transfer also makes it easy to share the videos with your friends. But iPad doesn’t come with a built-in DVD-ROM or DVD player for playing DVD. So how to put DVD movies on iPad if you wish to watch DVD on iPad? 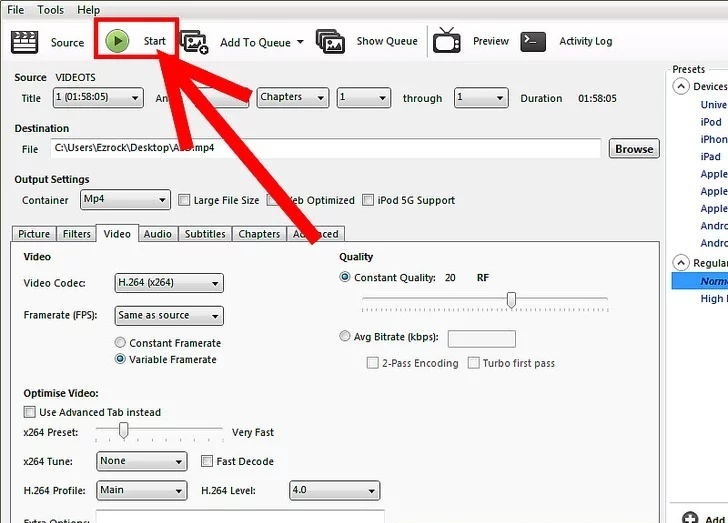 To do this task, you will need a tool to convert DVD movie to iPad format. Hereby, I will show you a brief guide on how to download movies to iPad from DVD. In this article, I will teach you the most convenient methods to convert DVD movie to iPad, then you are able to enjoy your movies on the go. As one of the best DVD ripper, Leawo DVD Ripper accepts all kinds of DVD discs. Besides DVD discs, this professional DVD converter also accepts DVD folders and DVD ISO image files as input, and converts to MKV, MP4, etc. What is more, the Leawo DVD Ripper is 6 times faster in DVD ripping and converting. With detailed video and audio parameters adjustable, original quality of source DVD content can be 100% retained. Find out how to put movies on your iPad from DVD. Step one. As Leawo DVD Ripper belongs to a part of Leawo Prof. Media. So after you have downloaded and installed the software, in the home page, select “Leawo DVD Ripper” to enter the “Convert” interface. Step two. 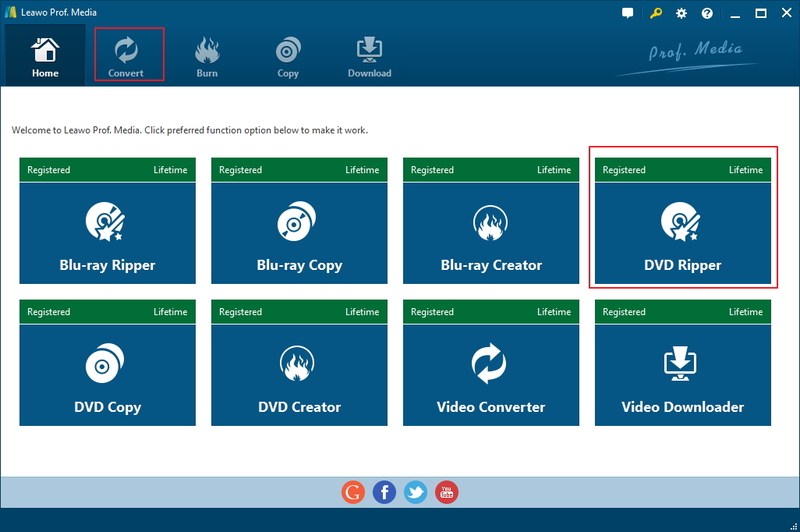 Click “Add Blu-ray/DVD” to import DVD disc, folder, or ISO image file on the “Convert” interface. There, you can find three options to import DVD file(s): Full Movie, Main Movie and Custom Mode. The three modes are a bit different. Full Movie is able to import all titles, Main Movie can import the longest title by default, while you can feel free to choose titles for importing under Custom Mode. Select the mode you need and click “OK” button. Step three. To choose output format for iPad, you can click the profile drop-down box named”MP4 Video” by default next to “Add Photo” button. Then, select “Change”>”Profile” to get to the right panel. You can choose either video/audio format or mobile device as output profile under “Format” or “Device” group. Step four. After profile settings, return to the “Convert” interface, click the green “Convert” button to set output directory for saving the output files. Step five. Click the “Convert” button at the bottom of sidebar to start ripping DVD Movie to iPad. Once the conversion is finished, you can click Output Folder button to get the output files. Riplt is almost the simplest program I have ever seen on Mac. How simple is it?it is almost a no brainer to rip a DVD to a digital file. With RipIt, you can select the main title automatically, or you can manually choose the title you want to rip. In addition, Riplt also saves both your MacBook’s battery life and your movie collection from scratches. 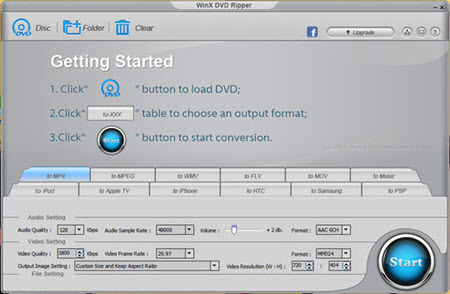 If you want to know more about how to copy DVD movie to iPad, check below. Step 1. Install and launch RipIt on your PC. Click “DVD Disc” or “+Folder” button to input your DVD source, which will take a few seconds for RipIt to detect the DVD. Step 2. Then you have two options – Compress or Rip. Click “Rip”, the DVD image is going to spin. Step 3. 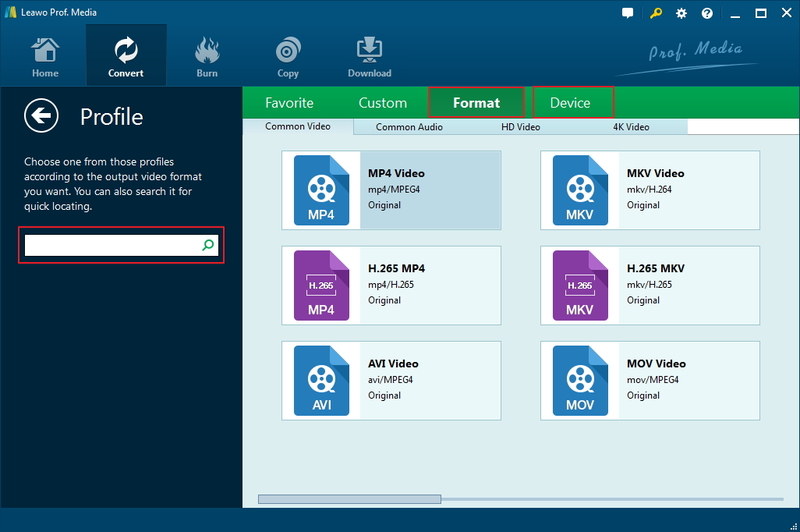 Choose an output format, such as “to MP4″, from the listed options on the interface. And set the destination to save your output digital file that is playable on your iPad. Step 4. Click the “Start” button. After about half an hour, you can enjoy your DVD movies anywhere without bringing the discs. These formats are currently limited to MP4, AppleTV and iPhone/iTouch. It even does not allow you to choose which language you want to compress from the DVD if it’s a multiple language disc. As a famous ripping program, HandBrake makes ripping a film from a DVD to a data storage device easier. With HandBrake, you find it convenient to get quick results by simply loading up a video into the program, and you can convert it to different formats with various settings in place. Furthermore, it can help convert video from almost any format to a plethora of widely supported and up-to-date codecs. Before we get into how to copy DVD movie to iPad, you can go to the Handbrake’s homepage and download the program. Step 1. Insert the DVD you want to rip, and launch Handbrake. Step 2. 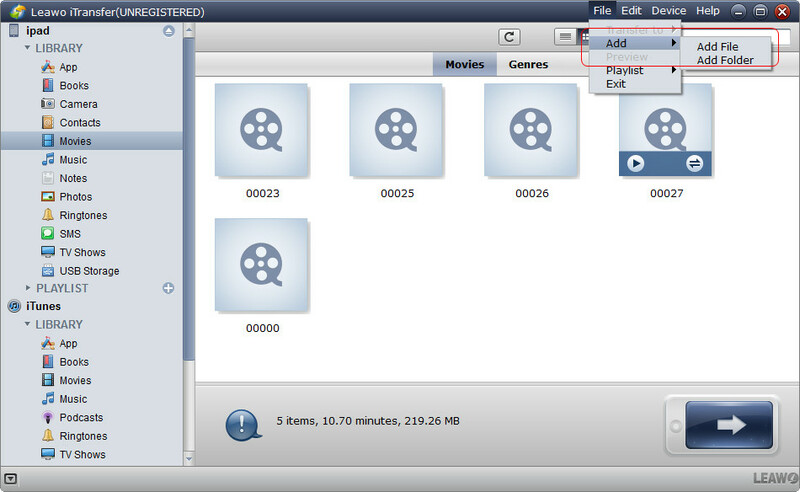 Click the “Source” button in the upper left-hand corner of interface and choose your DVD drive from the list. 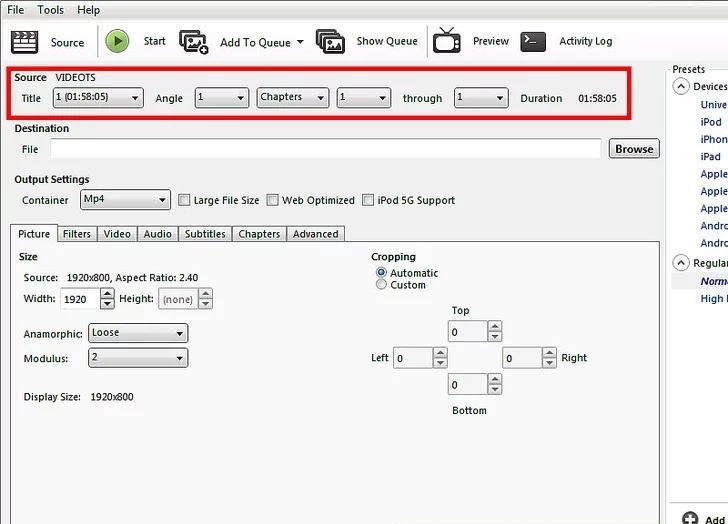 In the “Title” drop-down menu locating at the upper left side of the window, select which part of the DVD you want to rip. Step 3. Click “Browse” on the right side of the interface and set the directory you want to save your movie file, and type in a file name in the box. Click “OK”. Step 4. You can select “MP4” or” MKV” from the Format pull-down menu, but if you’re new to HandBrake, you might prefer to consult the “Preset” menu just above it. Step 5. Finally, hit the “Start” button at the top of the window to start ripping. When it’s done, you’ll get a pop-up notification. HandBrake is a free program that helps you compress video without sacrificing much of its quality. Though it seems like a lot of steps at first, it really isn’t very difficult. However, Handbrake can only rip unprotected DVDs, while most DVDs you buy from the store have copy protection. After trying the programs recommend above, you can get the DVD in your computer with the iPad format. Then now it is time to enjoy them on your iPad. We will discuss the situations separately to put DVD movie onto iPad with/without iTunes. How to put DVD movie onto iPad with iTunes? iTunes is a pretty good media management application with colossal set of features. So before we begin, please note that the latest iTunes version must have already be installed on your computer. But do not plug in your iPad. 1. Launch iTunes in your computer, and go to the “Home Videos”. 2. Now you need to drag the video from the place where you have saved the ripped files to the iTunes “Home Videos”. 3. Connect your iPad to computer with USB. Once your iPad is connected, make sure you have your iPad selected. 4. Select the “Movies” tab >>”Sync Movies” to choose the movie that you want to play on iPad. (You also have the ability to sync your apps and music. 5. At the end, press the “Sync” button. Later, you will find the ripped movies have been successfully transferred to your iPad. How to put DVD movie onto iPad without iTunes? 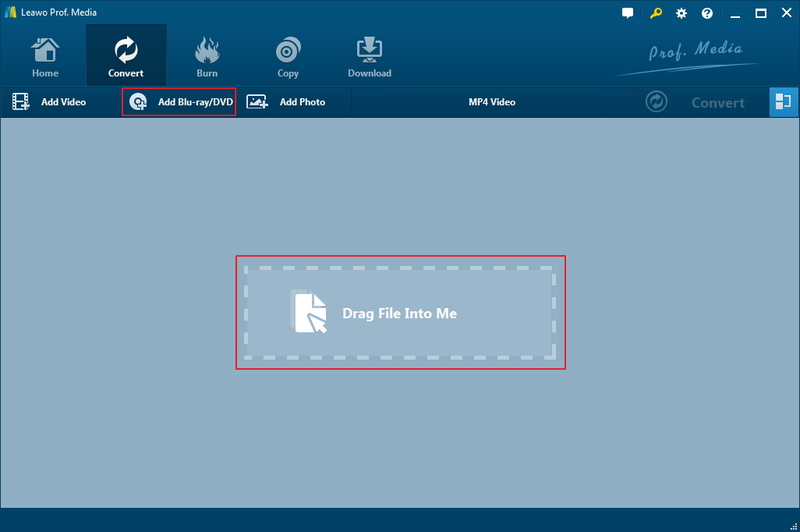 In this post, we have shown you how to transfer DVD movies to iPad 2. But what should you do if you do not install iTunes in your own computer? Do not worry. We will introduce you another useful too, the name of the app is called Leawo iTransfer. It’s simple to use, which goes where iTunes won’t be easy to transfer your iPad music back to computer. It works on both Windows and Mac platform. 1. Download and install iTransfer on your computer and launch it. 2. Then you need to use the USB cable that came with your iPad to connect it to your computer. 3. To put the movies files to your iPad, click “Add” under Home button of the interface. And you can browse and choose the movies that you want to put onto your iPad. 4. After selecting the movies you want, it will automatically transfer to the iPad when it completes. Wait for a while and open your video app on your iPad, you cannot miss these movie files waiting for you. In fact, you can also use Home Sharing to stream it to your iPad, for it can help you stream all your information, such as your music, movies and TV shows from iTunes on your PC to your iPad or iPhone. This is a great way to save precious storage space on your iPad. Therefore, when someone asks you “how do I transfer DVD movies to my iPad”, you can share these wonderful programs with him. After you have converted DVD movie to iPad format and put them onto iPad, you can enjoy your favorite movies during long journey hours or study your educational DVD material on the go.